This page continues to evolve as I come across more resources. Please contact me if there are any sites that you would like to see listed. I’ve listed below a range of blogs and websites and obviously they have different approaches. If a site is listed here it doesn’t necessarily mean that I support what it stands for and the contents of the blogs. Several of the women who run these sites have also written great books. You can read about my favourite books about childlessness here. Joining More to Life (MTL) (the UK charity providing support to those ‘facing the challenges of childlessness’ was one of the best things my husband and I did. I don’t know where we would be without the support of our M.T.L friends. World Childless Week aims to raise awareness of the childless not by choice (cnbc) community. To help the cnbc find support groups that understand their grief and can help them move forwards to acceptance. You can read more HERE. Walk In Our Shoes raises awareness in society of childlessness not by choice through a unique combination of a feet selfie and story telling. You can read more HERE. In Silent Sorority Pamela Jeanne offers a place for women embarking on a new life after infertility to express their ideas. You can find it HERE. Tracey Cleantis is a psychotherapist and blogs about how to find happiness when your dream doesn’t work out. This is her blog and for me her article about the Royal baby really put what many of us were feeling into words. In Ever Upward Justine Brooks Froelker’s tells her story and personally I find her blog really helpful. 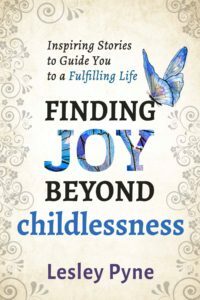 Civila Morgan who runs the Childless not by Choice website ‘helps women … find joy and meaning in their lives. I want us to live outside the labels society has set for us.’ I find her podcast interviews really interesting. Michelle Marie McGrath runs the Sacred Self website and in her Unclassified Women Podcasts she interviews a range of childless and childfree women. As I search the internet I find that there are more and more women writing about what it’s like to be childless. One I like is The Road Less Travelled which is HERE Loribeth also includes a fantastic list of many of these other blogs. Bent Not Broken is described as ‘Having kids didn’t work out for us…..working on plan B’ and is HERE. Forty and Everything After is a great blog about coming to terms with a childless life. You can read it here. On the Childless by Marriage blog Sue Lick says. “In a society where parenting is expected, some of us do not have children because our partners are unable or unwilling to make babies. That’s what this blog and my book, Childless by Marriage, are about. The website also lists an extensive list of books on chidlessness. And here’s Robin Hadley’s blog, Wanted to be a Dad. Robin is from the UK & has written a PhD on ‘Not being a father: the experiences of involuntarily childless men as they age’. Stumbling Gracefully – On learning to let go, live life and laugh out loud after infertility and loss. Stirrup Queen – as she says “the Stirrup Queen’s List of Blogs That Proves That She Really Missed Her Calling as a Personal Organizer”. A great resource for everything to do with infertility, alternative parenting and childlessness. If you’re struggling to answer people who say ‘why not adopt? ; Here are a couple of posts which you may find useful Infertility: adopting versus embracing and infertility part 2.